Over the past few years, business owners across the country have been buying business condominiums. Why? Because with today's low interest rates, it makes financial sense. A business condominium is very similar to a residential condominium. As an owner of a Crossroads Center Office Condominium, you will own and control your space. The common areas within the development, (parking facilities and landscaping) are owned in common by all of the unit owners and are managed by the Crossroads Center Condominium Unit Owners Association (CCCUOA). Crossroads Center office condos are fully built out with existing heating and air conditioning equipment, plumbing, floor coverings and restroom facilities. Purchasing an office condo has never been easier. Just follow these simple steps. First, tour our facility and pick your space. Then, sign a purchase and sale agreement. Next, work with our preferred lenders to secure financing. Finally, complete the purchase and turn the key. You can move in and begin enjoying the benefits of being your own landlord today. Buy now to take advantage of great savings while we roll out this condominium program. Prices will never be lower than right now! And for a limited time we are offering 90% owner financing for qualified buyers. For detailed information on how you can cut your operating costs in half, call Andy Walsh at (703) and he will show you how owning your own facility can save you thousands every year. 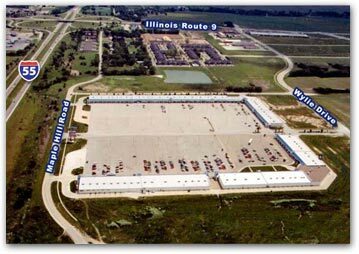 At the convergence of interstates I-55, I-74, I-39 and Illinois Route 9, Crossroads Center has a daily traffic count in excess of 100,000 vehicles.